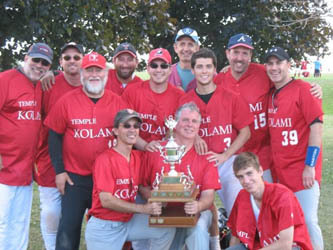 The team, established in 1995, participates in the ISBL (Intersynagogue Baseball League) along with 10-12 other teams from reform and conservative shuls in the GTA. Games are played on Sundays from May to September. Our proud record includes the league championship in 2009 and several trips to the finals. Currently, we boast 3 sets of father/son players. For information on how to join the team, please contact the office.